To infinity and beyond! Isn’t that a great and energizing phrase? Buzz Lightyear would certainly agree, as it’s his mission: To go further, be stronger, and ultimately be successful. Those of us who know the movie Toy Story can relate to his motivations. But we also recognize the many struggles he faces as some of our own. 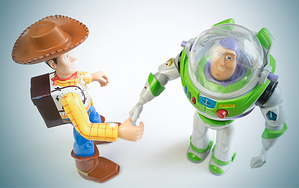 In the end, it was support and collaboration that led Buzz and Woody to be successful. The creative process that produced the hit movies Toy Story, Finding Nemo, and Inside Out offers lessons that can help nonprofits seeking to create collaborative relationships. In his book, Creativity, Inc., Ed Catmull, co-founder of Pixar Animation Studios and president of Pixar Animation and Disney Animation, reveals that Pixar films are produced through the creative efforts of numerous groups of professionals that must work together to create a movie project that meets both Pixar's high standards and box office expectations. According to Catmull, getting to a finished product involves idea sharing and joint problem solving. And he credits the company's success to teamwork that channels naturally occurring creative conflict in a positive direction. While most nonprofit organizations don’t have the resources a movie studio or large company has, his eight essential components to building Pixar's successful culture of collaboration are appropriately relevant to our sector. Establish a safe environment for exchange of ideas so that fear of failure or rejection is not an issue.